WhatRoute offers a number of preference panes in its Preferences window. General provides settings that affect the application behaviour in all its windows. Trace and Ping provides settings for the Trace and Ping commands as well as configuration of the geolocation engine. Map Settings provides settings map specific properties and also allows setting of flow colours. 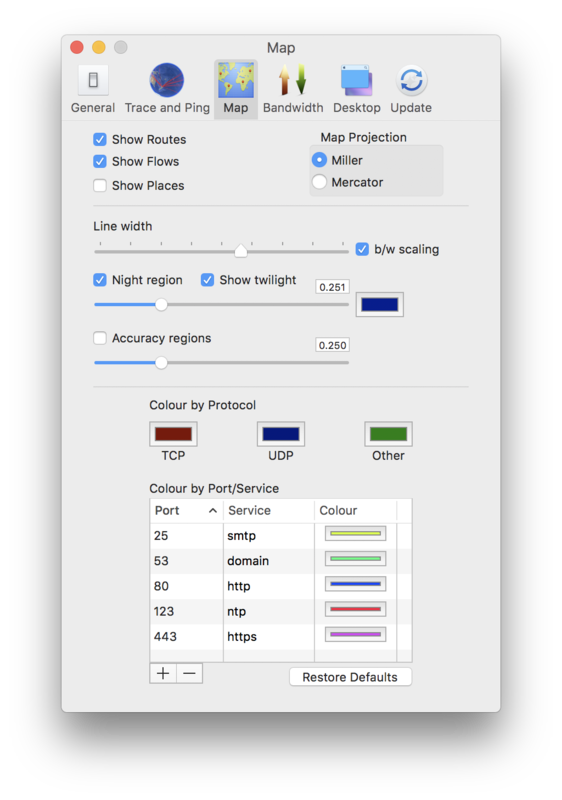 Desktop lets you choose a WhatRoute window for use as the Desktop image. Start WhatRoute automatically when logging in to your computer. Add a menubar display of current input and output network bandworth. Alternatively, just display the WhatRoute icon. The drop down menu allows control of the interface being monitored. The Flow Monitor and Bandwidth Monitor windows will immediately begin recording data when opened. Start WhatRoute in the background. Click the Dock icon to bring it to the foreground. Display the date and time at the beginnning of each command. If you are behind a NAT firewall/gateway, your LAN address is not exposed to the internet. It is translated to an address (usually) supplied by your ISP. WhatRoute will send a small request to a known internet site to determine this address, which is then feed into the geolocation engine to determine your location for presentation on the map. Ping all IP addresses in the active interface subnet when the Local Network window first opens. A bogon is an IP address that cannot be routed on the internet. These addresses cannot have a specific location as they may be used in many private network setups. If this option is checked any bogon addresses are not submitted to the geolocation engine. The Domain Name service (DNS) converts numeric IP addresses to familiar names and also performs the reverse function when required. If a response from the DNS is not received within the timeout period, WhatRoute will abandon the request. To reduce the amount of network traffic involved in querying the DNS, WhatRoute caches results for 5 minutes. This cache can be cleared (forcing a new lookup if requested) by clicking the Flush DNS Cache button. To convert IP addresses to locations on the map, WhatRoute consults data supplied by Maxmind (http://maxmind.com). This data may either be downloaded to your computer or alternatively, a network server can be queried to resolve locations. You can choose to only update the data on demand, or to have it automatically updated on a weekly or monthly basis. The Refresh button can be used to force an update of locally held data. Network masks can be used to coalesce the results for individual IP addresses into geographic regions. More detailed views of a location may be provided by the mapping services. See WhatRoute Map Viewer for details of the internal detailed map viewer. Use Location Services uses Apple location software to determine the location of your machine, overriding the location provided by IP address queries to the MaxMind geolocation engine. See Location Services for details of how WhatRoute uses these services. These settings provide parameters to the Trace function. Offset to timing results modifies the way in which results are displayed in the output pane of the Trace window. If this offset is enabled the results of the traceroute will start on a new line, indented by the specified offset. This is useful if you wish to constrain the data to fit within say an 80 character wide window. These settings provide parameters to the ping engine built in to WhatRoute. Show Routes display Traceroute paths on the map. Show Flows display Flow paths on the map. Line width adjust the width of paths on the map. b/w scaling make paths thicker (or thinner) depending on the bandwidth consumed. Night region show the areas of the planet where the sun has set. The region is kept up to date with the current time. It may or may not be very accurate and is intended as an indication only. You can adjust the intensity and colour of night with the auxilliary controls. Accuracy regions show a circle with radius of the Maxmind data accuracy. The slider will adjust the transparency of the circle. Colours define the colours used by the Map and also by the Flow Usage treemap. Select a window to use as the animated Desktop. The system default desktop will be used if the window is not open. When WhatRoute exits the system default desktop is restored. The popup menu determines how the window inage will be displayed on the screen. Fill Screen - The image is resized to fill the space between the bottom of the menubar and the doc. Space at either end of the Dock is filled with the colour selected in the colour swatch. Fit to Screen - The image is resized, with no change in aspect ratio, to fit between the menubar and Dock. Empty space is filled with the colour selected in the colour swatch. 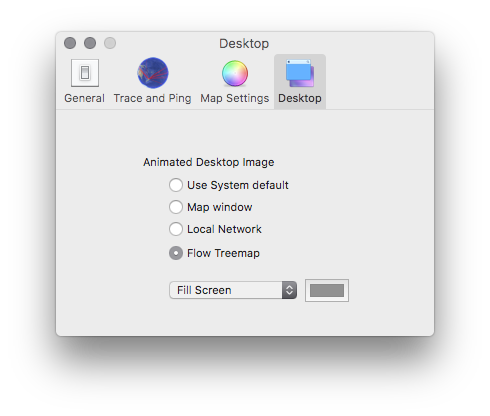 Stretch to Fill Screen - The image is resized to cover the entire screen and sits behome both the menubar and Dock.